Innovative Shower Curtain and Support Rod! With a range of easy to use shower curtains and rods we have a solution for you. 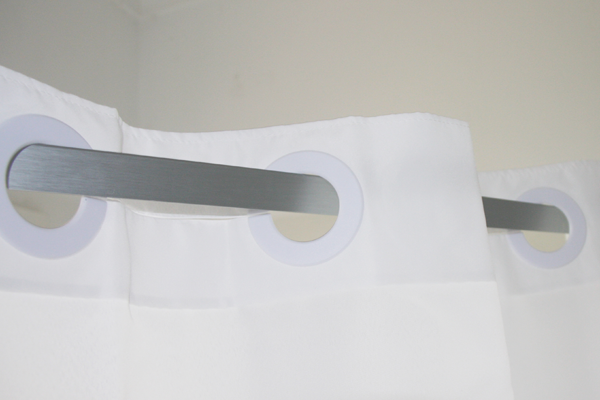 The Hookless shower curtain is designed for ease of installation. With split ring design built directly into the product, the Hookless shower curtain has revolutionised the Shower Curtain market. The unique design brings to an end the chances of broken or missing rings that cause outdated shower curtains to hang unattractively. 100% Polyester including mildew inhibiting elements, water repellency, ultrasonically cut bottom hem to avoid mildew build up and magnets at the bottom of each corner. Made from aircraft grade aluminium the Arc Shower Bar will not rust or tarnish. A flat 25mm bar design 1800mm length and can easily be cut to fit your needs. Wall brackets and screws are mounted for extra strength with an anodised, finish is included. Made of 25mm diameter, 1800mm long, stainless steel tubing, the cresent Rod will not rust. 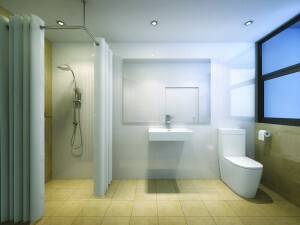 The one piece design gives extra strength and the cresent shape offers more elbow room in the shower. The swivel brackets are included together with screws, available in Chrome. 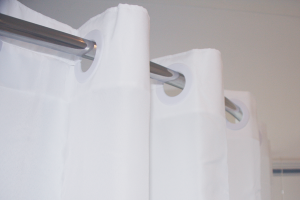 With the beauty and simplicity of the classic Hookless shower curtain, the 90° Hookless system is especially designed for corner shower situations. Corner showers with their open sides, pose difficulties in fitting shower curtain rods economically and attractively. 90° Hookless does both! The 90° Hookless system will open up any corner shower cubicle giving free access to the cubicle by means of a neat series of magnets holding the centre join gently in place, whilst allowing opening for quick and easy access. The rod has a neat threaded, adjustable centre support attached to the curtain rod at the bend (see illustration below). The curtain rod and support are high grade stainless, supplied complete with easy fit wall brackets. 100% Polyester, including mildew inhibiting elements, water repellency, ultrasonically cut base to avoid trapping soap and mildew build up. Sold in pairs – each curtain is 120cm (w) x 196cm (h). Available in white – to enable bleach cleanability.